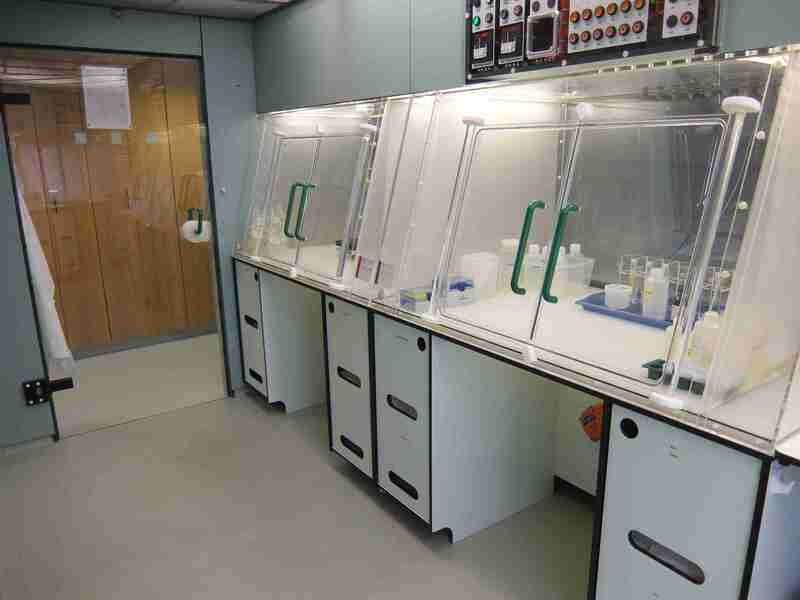 The team's research centre (CEPSAR) hosts a full metal-free clean room suite for the preparation of geological samples. There are seventeen PicoTrace Clean-Air workstations (class E XIV air supply), eight laminar flow work benches, five extraction units and a recirculating fume hood designed to work with organic solvents ensure a working environment that is clean for the chromatographic extraction and purification of chemical elements prior to isotopic measurements by TIMS or MC-ICP-MS. The laboratory is equipped with a 'ring main' Millipore reverse osmosis water supply and local Milli-Q dispensers (18.2 MΩ grade water) as well as with savillex sub-boiling distillation vessels for the purification of concentrated acids. Facilities in the clean laboratory also include two centrifuges, heated ultrasonic baths, and a balance room housing five and seven figure analytical balances. The laboratories are located within our Department of Environment, Earth and Ecosystems close to the offices.